Plants and human beings, animals included require nutrients to sustain their growth and health. There are mainly two types of nutrients called macronutrients and micronutrients and they can both be obtained from different diets and supplements that are consumed by human beings in particular. These include whole foods in the form of cereals, vegetables, meat, eggs fruits as well as eggs among other diets. Whilst both macronutrients and micro nutrients can be obtained from the same source, they significantly differ in various ways. The major differences between macronutrients and micronutrients pertain to the aspect of quantity required to ensure optimum health and their functions in the body. More details about the difference between macronutrients and micronutrients are provided below. 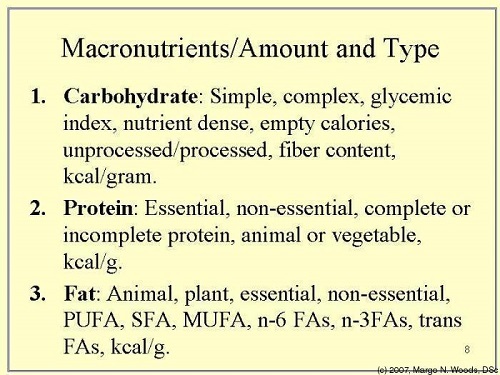 Macronutrients are required in large quantities in order to ensure optimum function of the whole body. Carbohydrates for example constitute macronutrients and these are often consumed in large quantities. Carbohydrates are high in fiber and they ought to be consumed in large quantities to promote growth in human. The same applies to meat and fish which contain high levels of protein therefore should be consumed in large quantities. Unlike micronutrients, macronutrients are specifically meant to enhance growth. They contain calories that help to provide the body with energy. For example, fats, proteins and carbohydrates are all examples of macronutrients and they help to provide different parts of the body such as kidneys, heart as well as brain with energy. This energy is specifically meant to ensure that these organs operate at optimum level to ensure best functionality of the body and quality health. In order for the body to function normally, it should have sufficient energy to sustain the functions of different organs otherwise insufficient energy can lead to fatigue. The main types of food that are rich in macronutrients include the following: meat, cereals, potatoes, yams, nuts, fish, water as well as oil seed among others. The other notable aspect is that excessive consumption of macronutrients in the form of saturated fats and carbohydrates can lead to health problems such as obesity or diabetes. Dental problems can also be experienced due to high acid levels that may result in excessive consumption of macronutrients. In other words, these should be consumed in proportional levels in order to attain optimum health among different human beings. 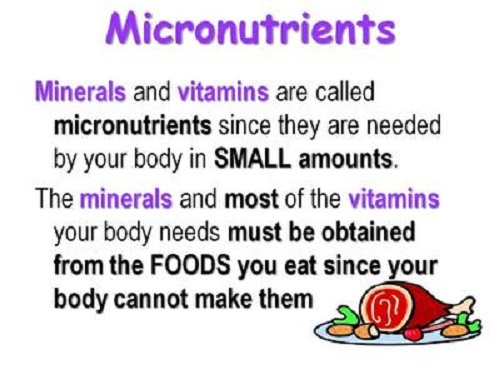 Micronutrients are required in small quantities unlike macronutrients. The main reason for this can be attributed to the source where micronutrients are obtained. Micronutrients mainly come from minerals which exist in smaller quantities therefore cannot be consumed in large quantities. Micronutrients do not contain calories that give energy in contrast to macronutrients but they are mainly comprised of high volumes of antioxidants. Essentially, these antioxidants play a pivotal role in protecting the body against various diseases. They also help to eliminate toxins that can negatively impact the health of human beings thereby promoting long life among them. On top of that, it can be observed that micronutrients are also vital in the creation of enzymes as well as other components that help to improve different functions of the body. Examples of micronutrients include minerals and vitamins that are often required in small quantities. Examples of different types of food that are rich in micronutrients include the following: fresh farm produce including green vegetables and fruits, iodized food as well as eggs. Research has shown that there is no effect on health for excessive consumption of macronutrients. These usually exist in small quantities and are good for detoxifying the body against unwanted elements. However, deficiencies in micronutrients can negatively impact on health. They can lead to problems like fatigue, poor vision or mental related health problems. In the event of deficiency in micronutrients witnessed, recommendations can be made to improve health. For instance, iodine can be recommended to improve thyroid health. As discussed above, it can be noted that macronutrients and micronutrients significantly differ due to a number of factors. These are summarized in broad categories below for easier understanding. Macronutrients are required in large quantities to ensure optimum health and body performance. These are usually found in large quantities in different types of food hence the reason why they are also required in large quantities. In contrast, micronutrients are usually required in small quantities in human bodies. They often exist in small quantities in different types of food. Macronutrients mainly provide the body with energy that is required by different organs to perform a variety of activities. It can also be seen that macronutrients are also responsible for other functions that include the following: repairing body tissues, energy storage in the body by carbohydrates while fats maintain temperature and vitamin storage, promote normal function of cells and blood clotting. Examples of macronutrients include the following: carbohydrates for energy storage, fat for storing vitamins as well as maintaining appropriate body temperature and proteins that are responsible for maintaining enzymes and acid balance. Examples of micronutrients include vitamins and minerals and these play a pivotal role in promoting healthy growth of hair, teeth, skin, cells, bones and development of a strong immune system that is capable of fighting different diseases in the body. Essentially, micronutrients are mainly responsible for disease prevention and promoting quality health. Excessive consumption of macronutrients can be detrimental to health since it can lead to problems such as obesity as well as diabetes among others. These significantly affect the normal functioning of the body and such a scenario is not recommended. Lack of sufficient macronutrients in the body can also lead to problems such as malnutrition and kwashiorkor. In contrast, there is no data that shows the effect of excessive consumption of macronutrients to the body. However, there are certain health related problems that can be caused by insufficient micronutrients in the body. For example, scurvy and goiter are two diseases that can be caused by deficiency of micronutrients in the body. Overall, it is imperative to maintain a proper balanced diet to ensure that the body has sufficient macronutrients and micronutrients so that optimum health can be attained. There is a risk of impacting the body in a negative way if proper steps are not taken to ensure that balanced nutrients are consumed always. Human bodies require nutrients that can be obtained from a variety of diets in order for them to attain optimum health. As noted, nutrients are divided into two broad categories namely macronutrients and micronutrients. Even though both macronutrients and micronutrients are obtained from the same source in some instance, they significantly differ in many respects. The major difference between the two is that they macronutrients are required in large quantities in the body while micronutrients are required in small quantities. On the other hand, macronutrients are specifically meant to provide energy and support growth of the body while micronutrients are responsible for disease prevention. As highlighted above, excessive consumption of macronutrients can have negative effects on the body since they can cause health related problems like obesity or diabetes. Insufficient macronutrients can cause health problems like malnutrition and kwashiorkor. However, there is no data that shows that excessive consumption of micronutrients can cause negative impacts on health. It has been observed that deficiencies in micronutrients can impact negatively on health and cause problems like scurvy, poor vision and weak joints among others. Effort should be put to ensure that a fine balance between the consumption of macronutrients and micronutrients is created to promote optimum health among different individuals. In most cases, the diet of the individuals determines their health status. Trevor Mark. "Difference between Micronutrients and Macronutrients." DifferenceBetween.net. October 30, 2017 < http://www.differencebetween.net/science/health/difference-between-micronutrients-and-macronutrients/ >.